Humphrey Otto Becher was born on 13 September 1908 at Harvey, Western Australia, son of Francis Joseph Becher, orchardist, and his wife Antonia Amalie (née Vetter) both Australian-born. Entering the Royal Australian Naval College (at Jervis Bay) in 1922, he had a good scholastic record and also won colours for hockey and tennis. In 1926 he served in the light cruisers HMA Ships Adelaide and Brisbane as a Midshipman, before travelling to Britain for further sea-training and professional courses with the Royal Navy. Returning to Australia in 1930, Lieutenant Becher went to sea in the RAN's heavy cruisers Australia and Canberra before electing to specialise as a gunnery officer. In 1932-34 he was based in England where he took the long course at the RN's gunnery school, HMS Excellent. On 7 January 1935 at St Michael's Anglican Church, Vaucluse, Sydney, he married Valerie Chisholm Baird; they were to have three sons. 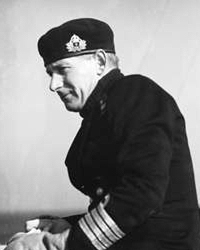 Following postings to HMAS Cerberus (Westernport), and to HMA Ships Canberra and Stuart, Becher was promoted to Lieutenant Commander on 16 June 1938 and returned to Britain for service on loan with the Royal Navy. At the outbreak of World War II he was the squadron gunnery officer in the cruiser HMS Devonshire. In May 1940 the ship supported the withdrawal of Allied troops from the Namsos region of Norway: for his performance during this operation Becher was awarded the Distinguished Service Cross (DSC). He then joined the destroyer HMAS Napier in November 1940 and saw action in the Mediterranean. On 26 April 1942 he returned to Cerberus as officer-in-charge of the gunnery school. He was then posted in command of the destroyer, HMAS Quickmatch, on 3 March 1944. For pressing home a successful attack on the Japanese naval base at Sabang, off Sumatra, on 25 July, Becher was awarded a Bar to his DSC. He was also mentioned in dispatches for his service in Quickmatch, and was promoted to Commander on 31 December 1944. From 1945 to 1948 he performed staff duties at Navy Office, Melbourne, before returning to sea to help commission the new aircraft carrier HMAS Sydney. His posting in command of the Sydney shore establishment HMAS Watson was cut short on 28 July 1950 when he hurriedly relieved Captain Alan McNicoll as commanding officer of the destroyer, HMAS Warramunga, which was about to sail for active service in Korea. Throughout a busy deployment to Korea, Becher confronted numerous operational problems which included poorly-charted waters, severe weather conditions and a complex command and control arrangement involving senior commanders from Britain and the United States of America. On 5-6 December 1950 Warramunga took part in the hazardous evacuation of Chinnamp'o and her accurate bombardment of Haeju in August 1951 received special praise. Becher was promoted to Captain on 31 December 1950 and he was also awarded the Distinguished Service Order (DSO) and appointed to the Legion of Merit (USA.) for his exploits in Korea. In the period from late 1951 to 1962 he occupied senior staff posts in Navy Office, among them appointments as Deputy Chief of Naval Staff during 1952-54 and 1959-62. He attended the Imperial Defence College, London in 1956, and also commanded the aircraft-carriers, HMAS Vengeance (1954-55) and HMAS Melbourne (1957-58). Having acted in the rank for twelve months, he was promoted to Rear Admiral on 7 January 1960. Becher was appointed as a Commander of the Order of the British Empire (CBE) in 1961 and was head of the Australian Joint Services Staff in London during 1962-63. In January 1964 Becher was appointed as the Flag Officer Commanding the Australian Fleet and was serving at sea in Melbourne during its collision with the destroyer HMAS Voyager on 10 February of that year. Then in 1965 he was posted as the Flag officer-in-Charge, East Australia Area. He retired from the Royal Australian Navy on 6 March 1966 after 44 years of service. Rear Admiral Becher passed away in Sydney on 15 June 1977.